ESPROS epc660 BSI ToF sensor is probably the world's only ToF device having its detailed datasheet (106 pages) openly available at the company's FTP site. Update: Other than the ToF sensor datasheet, ESPROS publishes the detailed board and system design guide, and eye safety analysis. Reuters: Sony announces its plans to raise $3.6 billion via new shares and bonds to expand stacked image sensor R&D and production. It's Sony's first new share issue in 26 years, worth close to a tenth of its current market value. The company expects to raise 321 billion yen ($2.62 billion) from a public stock offering and a further 119 billion yen from a convertible bond issue to fund a boost in sensor output capacity at its advanced plants in Japan. DPReview quotes Business Weekly Taiwan newspaper speculations that the next Apple iPhone might have a dual rear camera, similar to HTC M9+ and Huawei Honor 6+ phones. The original article talks about an interview with Largan CEO Linen Ping and the chances that Largan business would surge in future. No credible source was cited for these rumors. Insights From Leading Edge blog overviews image sensor stacking progress and recent publications. 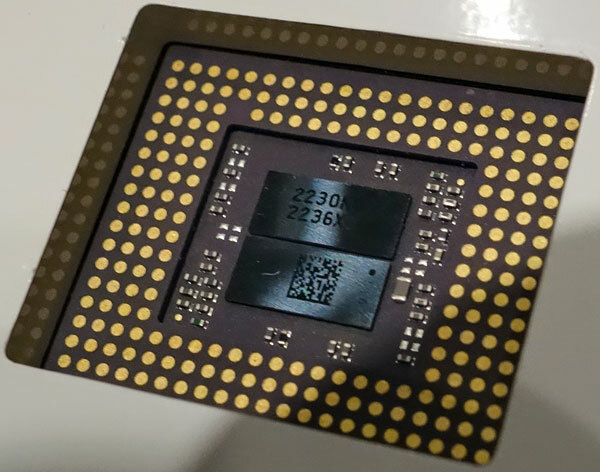 "Given the continued, aggressive stacked CIS development underway from independent device manufacturers (IDM) and foundries it’s predictable that stacked chip adoption will occur very rapidly over the next few years." Marketwired: Teledyne Dalsa presents TurboDrive, a proprietary and patent-pending data encoding technology that allows some DALSA GigE Vision cameras to achieve breakthrough speeds, increasing throughput by as much as 150% while retaining 100% image data. "We're pleased to deliver an innovative speed advantage to customers who need to push beyond the current GigE bandwidth limitations with no loss of data," commented Mark Butler, Product Marketing Manager for Teledyne DALSA, "It's available now in our low-cost Linea line scan cameras, and will continue in future area cameras set to launch in the fall." "Leveraging neighborhood effect Image entropy is the first principle used in TurboDrive. But to reduce even further the number of bits required to encode pixel information (with no loss of information), TurboDrive considers the neighborhood effect. The neighborhood of a pixel is the collection of pixels that surround it. Although the exact distance of a neighbor can vary, in this analysis, we will limit our example to the adjacent pixels (i.e. those that directly touch the reference pixel). For most pixels, there is little pixel to pixel variation and a lot of redundancy. Therefore, it is possible to efficiently use the information of the adjacent pixels to more efficiently encode the reference pixel. One way to see this is looking at a high-pass 2D filter implemented using a convolution. A simple high-pass filter has the sum of all of its coefficients equal to 0. The filter we use in our model has a 3x3 mask and it provides the largest weight to the center pixel. The result of this filter provides the difference between the reference pixel at the center, and four of its closest neighbor. It can be seen that, for a uniform image, the 9 pixels have the same value and the result out of this filtering operation is 0. Essentially, the less pixel to pixel variation, the smaller the value output by this high-pass filter. One can intuitively understand it takes less bits to encode a small value than to encode a large value. Obviously, it is possible to play with the weights of the 9 filter coefficients of this model to adapt to the image content." 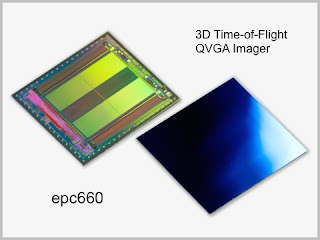 Sharp keeps investing in CCD development, presenting 14 new products and few more marked "under development:"
ESA Technology Exchange: Pixpolar pixel has been considered for ESA space programs, although the original article only mentions "A Finnish company [that] has developed a new image sensor technology based on patented MIG (Modified Internal Gate) pixel architecture." "The Company has participated in the development of a silicon drift detector (SDD) for X-ray applications within the TRP activity. The main goal of the project was to introduce extremely low noise SDD macro-pixels for X-ray detection applications. The Company is able to produce very low noise photon detectors for X-ray, visible, UV, near infra-red, and particle detection applications. MIG sensors are ideally suited for Space application as they enable simultaneously asteroid tracking as well as direct detection of planets around stars through continuous readout. Increasing the frame rate does not increase the noise, there are no interface issues, and they are tolerant to radiation damage." Albert Theuwissen continues his IISW review, this time talking about stacked sensors from Omnivision, Sony, Olympus, TSMC, and NHK. 16-megapixel IISW 2015 group picture and few others are posted on the Workshop site. If participants have interesting photos to post they are welcome to email them to jsolhusvik@imagesensors.org to add them to the web page. PRNewswire: Tektronix names Omnivision among early adopters of the new MIPI C-PHY standard, published in September 2014. 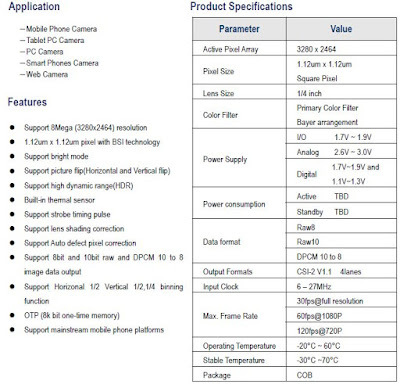 OmniVision's OV23850 and OV21840 20+ megapixel image sensors for smartphones have implemented the C-PHY 1.0 interface. Using Tektronix C-PHY Essentials analysis software, OmniVision and Tektronix were able to successfully validate and characterize the C-PHY interface used on the two new sensors. "With an up to 17.1 Gb/s data rate over a nine-wire interface, C-PHY provides the performance needed for high megapixel count image sensors along with low power consumption," said Brian Reich, GM, Performance Oscilloscopes, Tektronix. "Our solution for C-PHY transmitter testing allows engineers to detect issues early on in the product development phase and confidently assures transmitter devices' performance and interoperability." "OmniVision is excited to have Tektronix's oscilloscope-based C-PHY Essentials software for validating the next generation MIPI interface. With its three-wire signaling, C-PHY represents a significant design and test challenge," said Paul Gallagher, senior director of marketing and business development at OmniVision. "With the help of Tektronix C-PHY Essentials, we were able to easily set up cameras utilizing the OV23850 and OV21840 sensors and confirm the C-PHY interface's compliance with the MIPI specification." For some reason, the original announcement of OV23850 and OV21840 in Nov. 2014 does not mention C-PHY interface feature. 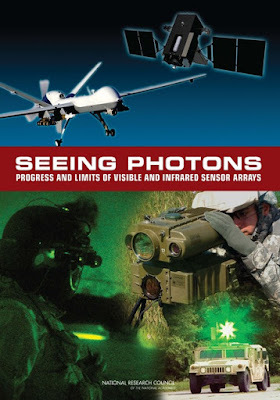 Albert Theuwissen continues his review of IISW 2015, now posting the part about image sensors for digital photography. This part talks about Samsung BSI APS-C sensor, Canon and Sony sensors with PDAF in every pixel, and DALSA large area CCD. GlobeNewsWire: TowerJazz announces that BrightWay Vision has chosen its TS18IS process to manufacture image sensors for its patented automotive cameras, specifically forward looking cameras in vehicles, to allow visibility in all weather conditions. BrightWay Vision has developed BrightEye, an advanced camera for day and night-time forward facing driver assistance functions based on gated imaging technology. TowerJazz and BrightWay Vision jointly developed a unique gated pixel, something that until now has never been produced on silicon as it requires extremely fast charge transfer on the pixel. This sensor, based fully on a CMOS process, provides superior performance over competing solutions based on thermal vision technologies, and is much more cost effective. A "gated" sensor allows collecting light that is reflected back from objects at a specific distance from the vehicle, thus eliminating the noise level that is usually associated with ambient light. This sensor also allows the system to accurately measure the distance of certain objects from the vehicle and alert the driver accordingly. Pulsed Light & Gated Image Sensor (BrightWay Vision active-gated imaging technology). Outcome: The image is clear and the person in the kayak is noticeable. The backscatter residual signal originating from the reflected signal from nearby droplets is negligible. Continuous Near Infrared Light & HDR Image Sensor. Outcome: Backscatter originating from the reflected signal from nearby droplets is masking the image. Outcome: The emitted signal of objects (e.g. person on the kayak) are masked due to the droplets’ emitted signal. "We are absolutely thrilled with the performance of our sensor using TowerJazz's leading edge CIS technology," said Ofer David, CEO of BrightWay Vision. "The tight cooperation on the development between our R&D team and the excellent pixel development team of TowerJazz, allowed us to produce a very high performing sensor that is now being evaluated by leading car manufacturers." "Our distinctive technology and deep knowledge and experience in global shutter pixels allowed us to develop a unique pixel that cannot be found elsewhere and can provide a gated image in a high frame rate with extremely good pixel properties," said Avi Strum, VP and GM of the CIS Business Unit at TowerJazz. "We have very high confidence in BrightWay's capabilities and ability to drive this breakthrough solution into the automotive market." One of the biggest NHK challenges is implementing the high speed video processing and delivering the broadcast traffic. Videonet article discusses a rapid adoption of PERSEUS codec developed by V-Nova, which possibly solves these problems. The London, UK-based startup V-Nova has been established in 2011, but came out of stealth mode in April 2015 "claiming that PERSEUS completely shifts the bit rate curve and makes it possible to deliver UHD in HD bit rates, HD in SD bit rates and SD in sub-audio bit rates." L. Anzagira and E.R. Fossum, Color Filter Array Patterns Designed to Mitigate Crosstalk Effects in Small Pixel Image Sensors, in Proceedings of the 2015 International Image Sensor Workshop, Vaals, The Netherlands, June 8-12, 2015. L. Anzagira and E.R. Fossum, Two Layer Image Sensor Pixel Concept for Enhanced Low Light Color Imaging, in Proceedings of the 2015 International Image Sensor Workshop, Vaals, The Netherlands, June 8-12, 2015. S. Masoodian, A. Rao, J.J. Ma, K. Odame and E.R. Fossum, A 2.5pJ Readout Circuit for 1000fps Single-Bit Quanta Image Sensors, in Proceedings of the 2015 International Image Sensor Workshop, Vaals, The Netherlands, June 8-12, 2015. E.R. 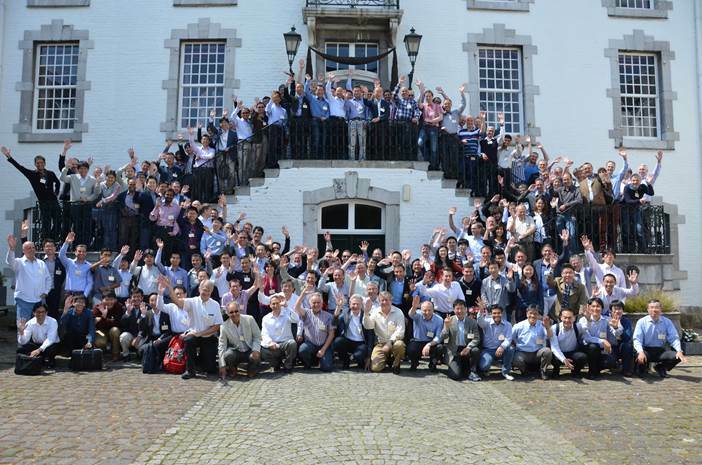 Fossum, Multi-Bit Quanta Image Sensors, in Proceedings of the 2015 International Image Sensor Workshop, Vaals, The Netherlands, June 8-12, 2015. "As we head into the 3D integration era, I predict packaging inventions will rise as a percentage of the whole. It’s also natural that as the imaging community gains access to lower power and higher density processing all the dreams of years past will come to fruition in the form of innovation at the systems and software level." 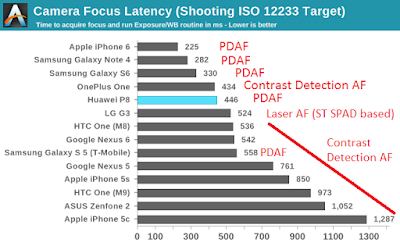 "For the time being pixel scaling has essentially plateaued at the 1 µm generation so all the mobile small-pixel leaders have been looking for other knobs to turn. A lot of development has been done to embed color filters into the tungsten aperture grid metal. Sony and ON Semiconductor (Aptina) currently hold the world record (based on Chipworks’ analysis) for getting down to a 1.5 µm thick optical stack, as measured from the back-illuminated (BSI) silicon (Si) surface to the surface of the microlens. There doesn’t seem to be much more to do here, but time will tell." 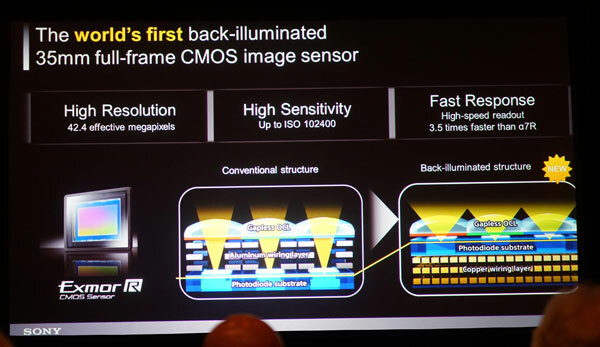 "Sony has about a two year lead in the domain of stacking image sensor chips... Depending on which flavor of Sony stacked chip system used, the image signal processor (ISP) can be either a homegrown (Sony) 65 nm chip or a TSMC fab’d 40 nm chip... My summary presentation slide and message was: if you aren’t excited about chip stacking, you should become excited about chip stacking!" Ray's IISW paper can be freely downloaded from Chipworks site. 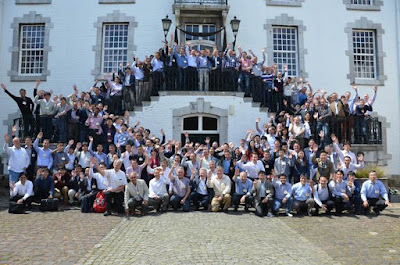 Albert Theuwissen posts his brief review and impressions from IISW 2015 held in Vaals, Netherlands last week. "In conclusion : no major new technologies were introduced, neither any pixel size below 1 um, but everything is getting better in performance and more compact in size." SuperPix Presents "the First Excellent Price 8MP 1.12um BSI Pixel Sensor"
Beijing, China-based Superpix launches SP8408, "the first excellent price 8-megapixel CMOS image sensor chip, the product in the world’s leading automatic 12 inch BSI process line production, production process without human intervention, to ensure that the product has excellent consistency and stability. The main performance index of SP8408 is better than other first-class 8M products in the market, the key index sensitivity is 9.5%, and high dynamic range (HDR) camera mode and low illumination enhancement mode. SP8408 pixel size of 1.12um, can be supports 1/4 inch 8 pixel optical lens. SP8408 capacity adequacy, as long as 2.5 months in advance to give demand forecast, can guarantee the stable supply of demand." 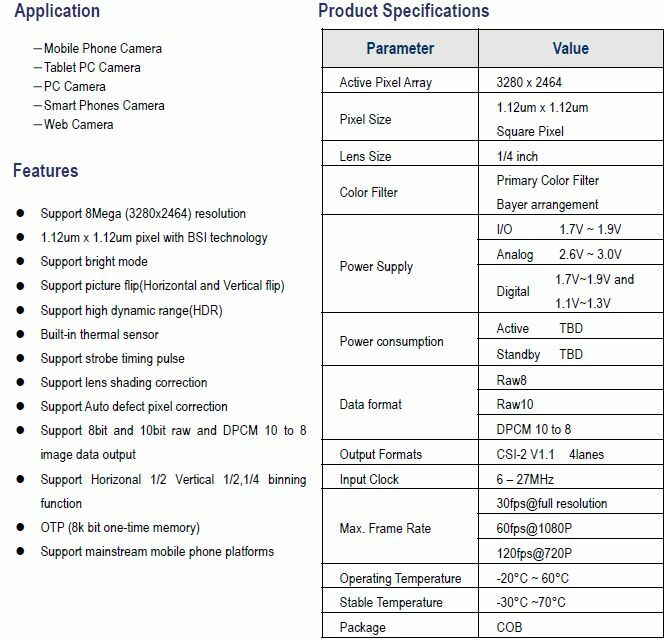 "The 1/4 inch 8-megapixel RAW data image sensor SP8408 is one of SuperPix’s upgrade products of SP84XX series color image sensors. It is a high performance sensor based on advanced 1.12um BSI pixel architecture. The SP8408 is a high cost-performance image sensor product that can be embedded in portable equipment, and is especially suitable for mainstream smart phones and tablet computer applications. Another Superpix LinkedIn article presents SP0A38 VGA 2.2um pixel SoC. The Board of Directors of the International Image Sensor Society (IISS) is pleased to announce the creation of a new award, the Pioneering Achievement Award. This new award is to recognize a person who made a pioneering achievement in image sensor technology, and judged by at least 10 years of hindsight as a foundational contribution. The Walter Kosonocky Award is presented bi-annually for THE BEST PAPER presented in any venue during the prior two years representing significant advancement in solid-state image sensors. The award commemorates the many important contributions made by the late Dr. Walter Kosonocky to the field of solid-state image sensors. Founded in 1997 by his colleagues in industry, government and academia, the award is also funded by proceeds from the International Image Sensor Workshop. 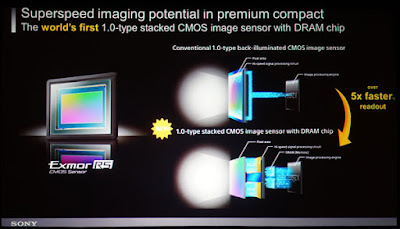 2015 Recipient : “A 1/4-inch 8Mpixel Back-Illuminated Stacked CMOS Image Sensor” ISSCC Dig. Tech. Papers, pp. 484 - 485, Feb. 2013. The best poster presentation is selected by the participants of the IISW. SeekingAlpha publishes comments of Baron Capital's Ron Baron in CNBC appearance: 13 years of data-collection efforts related to driver-assistance technologies has given the company a "essentially a monopoly" position for its ADAS chips and software. "When there's a tilt in the road, these guys will know about it and able to have the car steer a certain way because they've collected millions of miles of traveling [data]..." Mobileye has relationships with 23 out of the 25 top automakers. Business Wire: Teledyne announces the promotion of Edwin Roks to the position of Chief Operating Officer of Teledyne DALSA. Reporting to Rex Geveden, EVP of Teledyne and President of Teledyne DALSA, Roks will direct the operational activities of Teledyne DALSA and its digital imaging, medical, X-ray and professional imaging, and semiconductor divisions. His responsibilities will include financial performance, strategic planning, business development and research and technology integration. Dr. Roks also remains a VP of Teledyne, and will continue to advise Robert Mehrabian, Teledyne’s Chairman, President and CEO. "A Pump-Gate Jot Device With High Conversion Gain for a Quanta Image Sensor" by Jiaju Ma; Fossum, E.R. 42MP resolution has been chosen to ensure an easy image scaleability in various 4K video modes. If not that, Sony marketing would prefer 45MP or 50MP resolution. Other than the speed, Sony has improved the noise performance in the new FF 42MP sensor over the older 36MP one. The fast readout speed creates close to global shatter experience, although the shutter is actually rolling. Sony calls is "Anti-Distortion Rolling Shutter." The manufacturing facility, called QFAB3, is said to feature an unprecedented sub-5nm process geometry within an ISO Class 10 cleanroom. It is designed to support a wide range of products, from mobile phones to high-end cameras as well as drones and other IoT devices that require high performance cameras. InVisage’s product wafers are first manufactured by nearby TSMC and then transferred to QFAB3 for QuantumFilm deposition. The deposition itself is performed by a single, custom tool that combines spin-coating and CVD deposition technologies into one machine for the first time. This combination allows the deposition process to be both modular and fully automated. 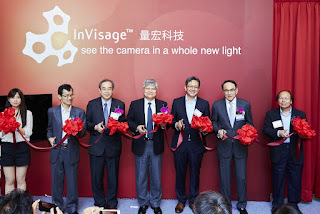 This is said to be the first of many facilities to come as InVisage increases its capacity aiming to QuantumFilm technology to become the new standard for cameras. "Spend so much money gone? After the factory opening ceremony, "Electronic Engineering Times," given the opportunity and InVisage company CEO Jess Lee one interview, this is the first question I can not wait to put forward. 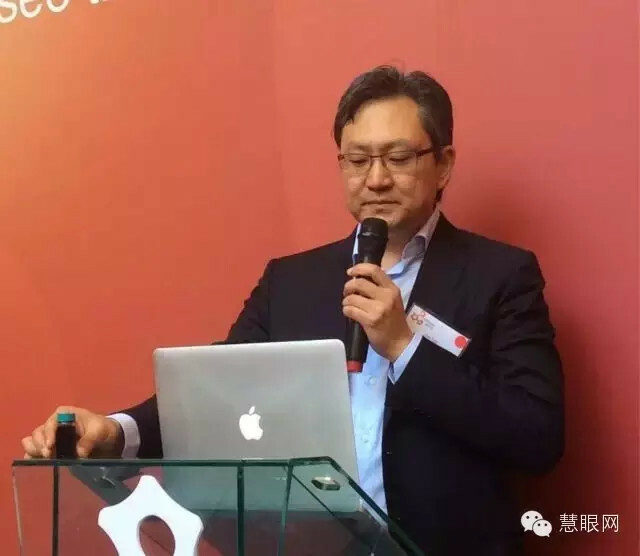 "Basic money spent these years of research above and the corresponding, because the TSMC outsource the manufacturing part of the silicon, so in fact our factory investment is not large. "InVisage all the issued and pending patents has reached 102 items. And now Fab3 upcoming production, InVisage finally began to have an income. 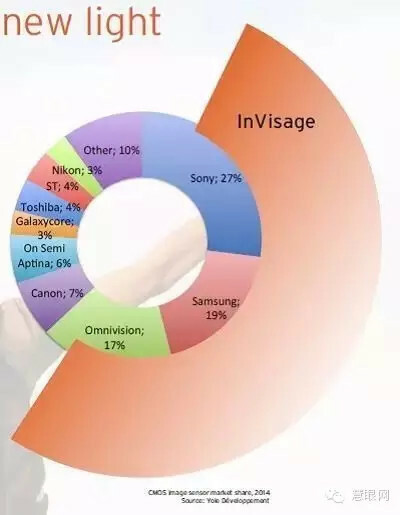 In addition, InVisage also won the two top camera's contract, and has received a total of 10 million dollars in the first phase of development costs. "However, if you need a more rapid expansion of production, we may also consider re-attract some investment." Lee expressed." "In the semiconductor industry, which is the only one I've heard from inception to launch the first product requires 10 years of IC companies, and that decade also continued to be favored by institutional investors, with 100 million dollars was built out first a product." "VisEra do this layer of the color filter, in fact, before I was a little worried, after all, is different from the silicon quantum film, will not be splitting ah, for specifically ask Mr. SC Schin VisEra, he said, "There is absolutely not, on the contrary, because the surface of the quantum film will be more smooth for us, but also easier." "Pixel size is not a limiting factor, can be nanoscale, "but in order to cater to the mainstream, our first product will choose between the 1.1-1.4um until mature market culture Then, again using smaller pixel size. Lee said." "For InVisage of Sensor, Lee has revealed that the main chip and the two major mobile phone manufacturers to develop, integrate optimized for InVisageSensor ISP in its main chip." Thanks to HTL for sending me the link! Digitimes reports that TSMC is looking to expand its presence in the CIS field, according to the newspaper's sources. TSMC gets orders from Aptina and Galaxycore, and partners with Invisage. "TSMC will also be able to secure orders from OmniVision, if the fabless firm wants to stay competitive in the mid- and high-end market segments." 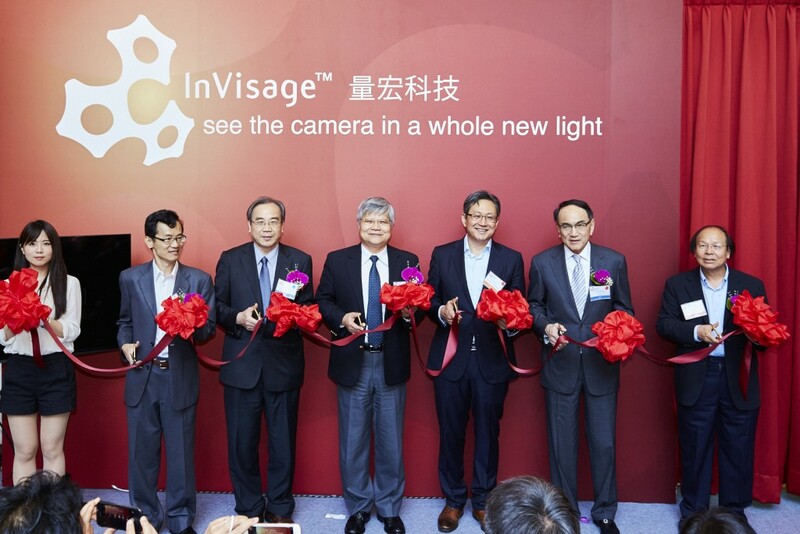 "In other news, InVisage recently announced the inauguration of a manufacturing facility nearby TSMC's manufacturing site at the Hsinchu Science Park, northern Taiwan. "After a review of various U.S. and Asian locations, we chose to establish our high-volume manufacturing in Taiwan because of the vitality of the semiconductor ecosystem here, and in particular because of our partnership with TSMC," said InVisage CEO Jess Lee in a statement. The facility, dubbed QFAB3, will be engaged in the manufacture of CIS based on InVisage's proprietary QuantumFilm technology. "InVisage's product wafers are first manufactured by nearby TSMC and then transferred to QFAB3 for QuantumFilm deposition," said InVisage." 1. "CMOS image sensor reaching 0.34 eRMS read noise by inversion-accumulation cycling"
Record for lowest read noise in CIS. CMOS pixels is pushed a little bit further again, as reported in our 3rd IISW paper. The value of 0.34 (sic) electrons RMS is obtained at the cost of accumulation-inversion cycling, severe oversampling and cooling down to -40°C. 2. "Four Concepts for Synchronous, PSN limited, true CDS, HDR imaging"
Comparing 4 HDR methods. Here we use a pretty strict definition of “High Dynamic Range”: It must at the same time comply with: 1) knee-less fully linear 2) allowing RWI synchronous shutter and 3) complete CDS. 3 methods are actually Caeleste patents, the 4th is the historical “overflow barrier” method. 3. "Imaging sparse events at high speed"
Ultra-high speed readout of a sparse image. The first imager to realize ultra-high speed sparse readout of a megapixel small-pixel (8µm) array, by copying a “SLICE” of the pixel array data into a processor array. The below 1Mpixel prototype is able to output about 8000 frames per second. PRNewswire: OmniVision announces a new ultra-compact CameraChip sensor for medical and industrial applications. The 1/18-inch OV6946 captures 400 x 400 pixel resolution images and video in an extremely compact 0.9 x 0.9 mm package, making it an ideal camera solution for minimally-invasive, reusable endoscopy. Utilizing a 1.75um OmniBSI+ pixel, the OV6946 captures video at 30fps. The OV6946 enables endoscope modules with a width of 1.65 mm and height of 5 mm. Additionally, the sensor's reduced pinout and basic ISP functionality offer extremely easy integration. The OV6946 is currently available for sampling and is expected to enter volume production in the third quarter of 2015. PRNewswire: OmniVision partners with preferred solution providers Precision Optics Corporation, Inc. (POC) and Fujikura Ltd. to develop the 160K (400 x 400 pixel) camera module, a quick go-to-market camera solution for OEMs. POC is a leader in designing and manufacturing micro-optics and associated medical imaging devices, and Fujikura is a leading miniature CMOS imaging module manufacturer. Based on OmniVision's new OV6946 sensor, POC's Microprecision lens technology, and Fujikura's flexible micro-coaxial cable technology and small packaging capability, the 160K CIS module provides high quality images and video with a distal end diameter of only 1.60 mm. Evaluation units of the 160K CIS module are currently available, and volume production is expected to begin in 2016. TowerJazz announces its support for the Cadence Virtuoso Layout interactive Electrically Aware Design (EAD) for all of its 180nm processes, including TS18IS (image sensor) process. In the automotive segment, our momentum in fast growing advanced driver assist systems market remains intact, and we continue to be market leader with approximately 70% share for image sensors for ADAS-related applications. I was wondering if you could spend a little bit of time just talking about the competitive landscape for Aptina. 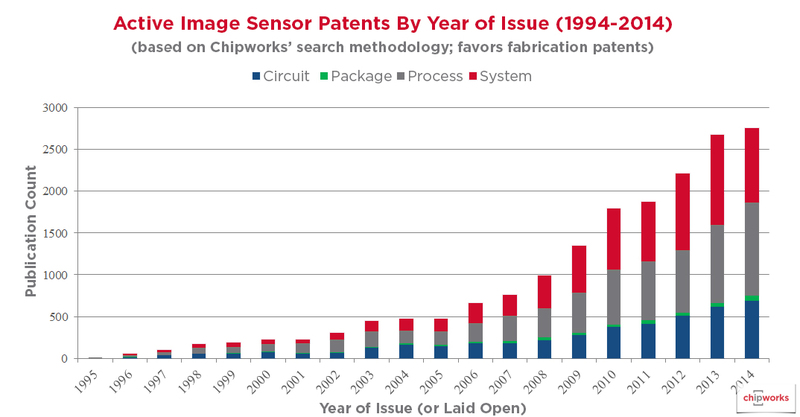 I mean clearly the image sensor marketing in auto ADAS is an area of pretty strong strength, but we are getting some signals of sort of industry capacity going up on the image sensor front. How do we think about that relative to the competitive dynamics? And can you talk a little bit about sort of the capacity needs that you have for your own imaging sensor business? Well, there are two other very strong players both of which have very significant handset exposure and the capacity on the handset side remains I think a key area for expansion. As you look at the automotive, it’s more than just the ability to produce pixels. You have to have the entire package for the automotive wins, particularly in safety critical applications. And we think we continue to have an edge there with our many years of experience. Relative to capacity, we have been working to increase capacities both internally and with our external partners, and are very comfortable we can see very strong growth and share gains supported for our image sensors this year. ...my follow up for image sensors, could you talk about the implications of OmniVision getting acquired by a China entity, would that be a positive or a negative? Would that make the China business more competitive, perhaps favoring a local supplier? I think over time there can be some influence on the market from a favored China supplier. I think in the short term, there’s going to be lots of confusion and changing; some announced intension to change of manufacturing, et cetera. So we’re looking forward to some short-term opportunities. And then we’re just going to keep driving on the technology side so that our products basically will be favored and the local favoritism won’t matter. "Today, the major UAV vendors include DJI, a Chinese company expected to reach $1 billion in sales this year; Parrot in France; and 3D Robotics in the U.S. Larger companies are trying their wings as well. Google bought drone-maker Titan and plans to start testing drones later this year. Amazon Prime Air plans to use its drones for package delivery." "Ambarella chips produce high quality video in very low light conditions and incorporate “dewarping” technology that can correct distortions from wide-angle lenses, allowing for better discrimination of detail, he says. They also have frame rates as high as 60 frames per second, enabling smoother video of fast-moving events like sports." First, OmniVision management must fix the technology gap by massively investing in technology with foundry partners TSMC and now with their move to use XMC as main foundry partner. Second, they must build market partnership and tie themselves closer to loyal customers. Smartphone cameras have become so important that trust and reliability has become essential. Third, they must get access to capital in order to finance technology and product development in a quickly evolving market. By becoming Chinese, OmniVision is providing the right answers to those 3 aspects." "Another type of temporal noise source is random telegraph signal (RTS) noise, which introduces “blinking pixels” from which the output exhibits three discrete levels. However, RTS noise does not appear to be a limiting factor on the performance of today’s image sensors." PR Newswire: Sony announces a mirrorless Alpha 7R II camera featuring a world's first full frame BSI image sensor. The newly developed 42.4 MP back-illuminated CMOS sensor is said to be "the most advanced, versatile and highest resolution full-frame image sensor that Sony has ever created." The new sensor combines gapless on-chip lens and AR coating on the surface of the sensor’s glass seal to improve light collection efficiency, resulting in high sensitivity with low-noise performance and wide dynamic range. This allows the camera to shoot at an impressive ISO range of 100 to 25600 that is expandable to ISO 50 to 1024002. Additionally, the sensor’s back-illuminated structure, with an expanded circuit scale and copper wiring design, enables faster transmission speed, approximately 3.5x faster than the original α7R. The new full frame sensor features 399 focal-plane phase-detection AF points, said to be the world’s widest AF coverage on a full-frame sensor – that work together with 25 contrast AF points to achieve focus response that is about 40% faster than the original model. The sensor supports 4K (QFHD 3840×2160, 30fps) video recording in either Super 35mm crop mode or full-frame mode. In Super 35mm mode, the camera uses information from approximately 1.8x as many pixels as 4K by using full pixel readout without pixel binning and oversamples the information to produce 4K movies with minimal moire and ‘jaggies’. In full-frame mode, the α7R II utilizes the full width of the 35mm sensor for 4K/30fps recording. It is said to be the world’s first digital camera to offer this in-camera full-frame format 4K recording capability. PRNewswire: The second Sony announcement is the world's first 1-inch stacked sensor featuring in compact DSC-RX100M4 and DSC-RX10M2 cameras. The stacked Exmor RS CMOS sensor is said to have "advanced signal processing and an attached DRAM memory chip. The high speed signal processing and DRAM memory chip work together to enable more than 5x faster readout of image data and are responsible for a variety of standout features that have previously been available in only a select few professional-level video cameras. These impressive capabilities include 40x super slow motion video capture at up to 960 fps, an ultra-fast Anti-Distortion Shutter with a maximum speed of 1/32000 second, high resolution 4K movie shooting and more." "Additionally, the ultra-fast readout of the image sensor is responsible for the high speed Anti-Distortion Shutter (maximum speed of 1/32000 second), which allow the new cameras to capture sharp, crystal clear images with a wide open aperture at brightness levels up to EV197. It also minimizes the “rolling shutter” effect commonly experienced with fast moving subjects." DPReview states that the 4K video mode frame rate is 30fps, the same as with the previous generation non-stacked 1-inch sensor. Update: Additionaly, Sony says it "is the world’s No. 1 manufacturer of image sensors for digital cameras and video recorders, with over 50% market share. Data based on Sony research from April 2014 to March 2015." Update #2: DPReview writes "Internally, we're told, Sony's engineers judge that their new 1-inch-type stacked CMOS sensor is roughly five years ahead of anything else on the market, and on paper at least, it's hard to argue with that assessment." Reuters: Tomoyuki Suzuki, head of Sony's device solutions business, said he expected sensor sales to grow about 100 billion yen ($804 million) to 550 billion in the year ending March 2016. That would be slower than the 40% rise of the previous year. But Suzuki said demand was so strong that Sony was struggling to keep up. "We're seeing very good demand at the moment," he told Reuters in an interview. "We don't have slack." Apple is Sony's top customer, followed by Samsung. Chinese handset makers such as Xiaomi also use Sony sensors for high-end models, analysts said. "We want to be inside a variety of customers," Suzuki said. "When it comes to semiconductors, if you can't make use of production capacity you quickly end up with a loss. So if you want to avoid that volatility the important thing is to have good balance with several customers." "Of course we will meet the requirements of our top customer, but we are expanding capacity with orders from Chinese smartphone makers in mind," Suzuki said. The superior low-light sensitivity would give Sony an advantage as it expands into automobile-related products, Suzuki said. "The ESPROS TOF technology is gaining huge momentum. The delivery start of the 3D-TOF QVGA imager was excellent. Customers immediately recognized the performance of our OHC15L technology. A QE of more than 80% at 850nm wavelength and pixels with 100% fill factor provide unmatched sensitivity with very low illumination power. A reference design of a camera engine with a horizontal FOV of 94° achieves a 10m range in the full field. Ok, this is on a white target. But the exposure time is a few milliseconds only." Correction: Samsung Galaxy S5 has PDAF too - added to the picture. This makes the chart even less conclusive. I've just noticed that a year ago Korean SETi had been reverse merged with G-SMATT Global. The LED panel glass manufacturer G-SMATT is now trading under the former SETi ticker at KOSDAQ. G-SMATT is still selling the older SETi image sensors, but its main business is in glass manufacturing. This is pretty sad news for a company that once controlled a significant portion of Chinese image sensor market. Thanks to BS for the info confirmation! 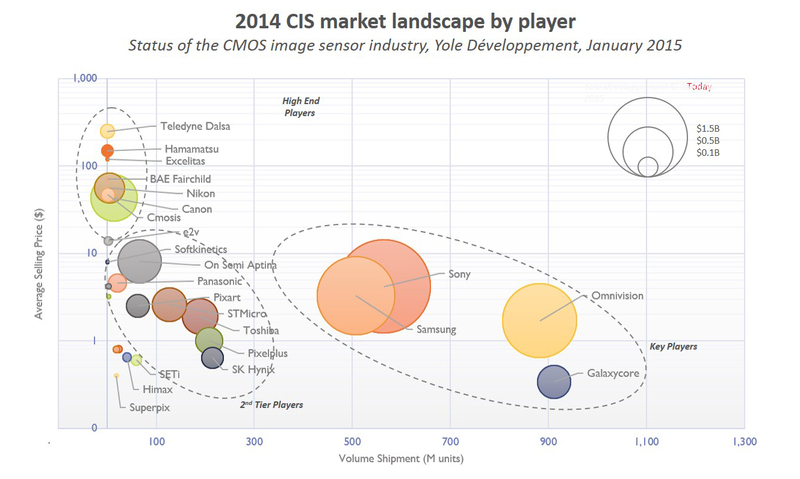 In spite of SETi demise, Korea still has a relatively large number of smaller image sensor companies: Pixelplus, Clairpixel, ZeeAnn, Maru LSI, and Rayence. Update: Rayence has been acquired by GE Healthcare in 2013. Thanks to RT for the info. Aptina patent application US20150146054 "Image sensors with color filter elements of different sizes" by Brian Vaartstra, Mitchell J. Mooney, and Stanley Micinski describes the small pixel challenges "Typically, each color filter element in a conventional color filter array has the same size and shape (i.e., each of color filter elements R, G, and B are square and occupy the same area). As pixel size becomes smaller with each successive generation of imaging sensor devices, one problem that may arise is the diffraction limit of red light. Due to this diffraction limitation, the quantum efficiency may be significantly degraded for pixels that are smaller than 0.7 microns on one side (as an example). It may therefore be desirable to form color filter elements of varying sizes optimized for the wavelength(s) of interest." "Color filter element 102-X may be a yellow color filter element, a green color filter element, a cyan color filter element, a magenta color filter element, an infrared-pass filter element (e.g., a filter that passes infrared light), an IR-block filter element (e.g., a filter that blocks infrared light), a clear color filter element (e.g., a filter that passes all visible light), or any combination of color filter elements (e.g., in each unit cell, one X pixel containing a green color filter and the other containing an IR pass filter)." Jiangsu SmartSens Electronic Technology Co.